Diverting down another by-way, we turn to adult education. By the 1840s/1850s, if not earlier, there were two privileges of the middle and upper classes which the working class strove to attain both through political channels and by practical application – the right to vote and education. By the 1940s, both had been largely or entirely achieved; but sufficiently recently for them to remain valued. 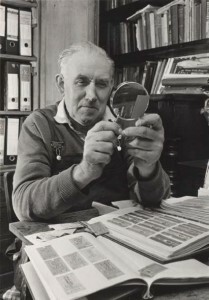 I want to deal with the education of two men of working class origin who successively influenced me – my father in respect of formal education and bringing me up, and ten years later, Jack Purton on historical research and many wider topics. My father, born in Bradford in December 1883, as already mentioned, was the ninth and youngest child of a journeyman cooper. 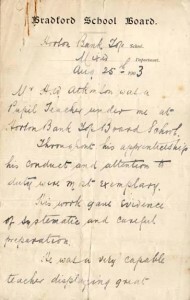 At the age of nine he faced the prospect of half-time education, half-time working in the mills; but he instead became a pupil-teacher, half-time himself being educated, half-time teaching younger children. 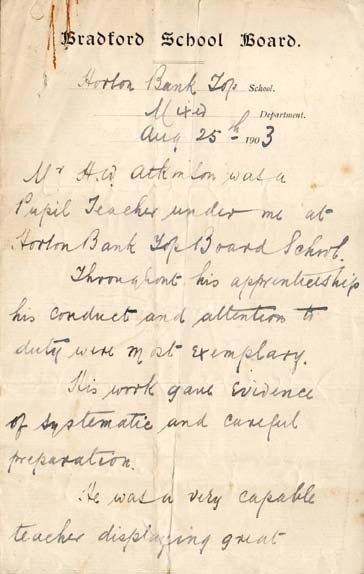 He continued in this role (or, at least he was termed “pupil-teacher” in a letter dated 25 August 1903 illustrated here) until, at the age of 18, he took employment with Bradford School Board, becoming an Assistant Teacher. In 1906, he enrolled as an External Student at the Royal College of Science, London University and, in due course, gained a 3rd Class Honours degree. He was appointed a Factory Inspector in January 1913. In the 1920s, he read for the Bar and became a Barrister at Gray’s Inn in May 1922, though he never practised in the Courts. Before his death in 1940, when I was 12, he tried to ensure that I had a full, and as far he could contrive it, fairly broad education. Horton Bank Top School, Aug 25th 1903. Mr H.W. Atkinson was a Pupil Teacher under me at Horton Bank Top Board School. Throughout his apprenticeship his conduct and attention to duty were most exemplary. His work gave evidence of systematic and careful preparation. He was a very capable teacher displaying great ability in the management of his class. He was very sympathetic with the children and readily gained their attention. Jack Purton, my mentor in historical research, came into my life from late 1948 onwards, when I was in my early 20s. At that time he was a rather militant communist shop steward at Duple Motor Bodies, Hendon. But I met him in London as a fellow member of the Ticket & Fare Collection Society. I was searching for knowledge, and he was delighted to have a receptive pupil. He taught me sources of information on bus history, London history and broad general knowledge. He introduced me to the Patent Office Library, which was then just off Chancery Lane and quite easy for me to visit at lunch times. It had a remarkable stock of bound transport magazines, accessible on open shelves. Jack also pointed me to the Guildhall Library for research on London horse buses and to the Reinohl Collection of tickets and water colours of the London horse buses, at that time housed at the Institute of Transport in Portland Place. He urged me to snap up a second-hand copy of Harold Clunn’s The Face of London (1937 edition). This self-taught working class man made abundantly clear his scorn for many people – whether bus ticket collectors or in other walks of life – who did not enquire into why things had developed and taken the form in which we now found them. However, he acknowledged that bus ticket collecting was widely scorned as only one rung up the ladder from fag-end collecting. Displaying independence from orthodox communist views, he held in quite high regard the two surviving London independent bus operators not compulsorily absorbed by the mighty London Passenger Transport Board – Birch Bros. and the City Coach Co. Ltd. He was a mine of information on, and even had tickets from, some of the London motor coach operators, particularly in the East End, operating day trips to Southend, Clacton, Brighton or other resorts and to greyhound racing at Walthamstow or football at White Hart Lane. Jack was born in Kilburn, North London in 1904, and lived there for nearly fifty years. His teacher had brought paper bags full of bus tickets that she had picked up on the pavements and distributed them to the children when teaching them arithmetic, making them add up, or sometimes subtract, the serial numbers on the random four or five tickets that she had doled out to each child. It had taught him both mental arithmetic and the fascination of collecting bus tickets.